Hi Friends! Factory Reset Protection (FRP) is a security feature on android devices with lollipop 5.1 and higher in order to help users keep all their data protected. Most Smart phone users buy used mobiles for their domestic use because they don't afford the high cost in case of buying new ones The owners of these sold or used mobiles activate their smartphones by their own google account and passwords and hence in this way the become legal owners of their mobile phones. After using for some time most users cell out their mobiles and buy new ones of their interest. Now, it is difficult to know that whether these used phones are sold through proper channel or they are being theft and sold. In such a confusing situation, if some of the used phone users wants to recover or flash out their mobiles so that they could insert their own google account and want to become the real owner of their mobile. In that case, if they don't have or know the google account information of the real or first owner of the phone, they can't reactivate or they can't re-boot their new phone bought. How Factory Reset Protection works. It functions this way: in case, the FRP is activated and unfortunately your Google android mobile is reset through the recovery menu, the android mobile phone then will demand you to re-enter the main google username and password which was previously inserted on the mobile device by its original owner, before it will successfully boot up again. It means that if someone steals your personal mobile phone and wants to reset it from recovery, there is no chance for them (The theft) to use in. This is called Factory Reset Protection, and discourages the thieves from stealing a phone and resetting it to make it their own. You can now unlock or bypas Factory Reset Protection mechanism utilizing FRP Unlock Toll by downloading it from the link shared below. FRP Tool can easily unlock FRP on Samsung, HTI, Huawei, Motorola, Lenovo, LG, ZTE OPPO, Xiaomi, Alcatel, Soney and many other Andoid Operating Running devices. 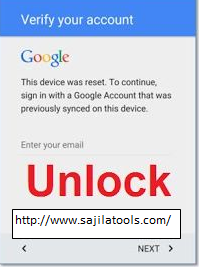 By using this powerful and amazing tool, you can unlock or bypass your smartphones without knowing Google Account Information and you can become the real owner of your phone by activating it with your own google account and password after resetting and bypassing.